debut for Esquisabel - 6ft3 tall. Kongolo won the vacant EE-Eu 175 lb title on scores of 119-110, 116-113 and 117-111.
vacant GBU 154 lb title - and yes, Chiruta is now World champ! Kabayel retained the EBU title with a close, upset win over Chisora, who again showed a little too heavy and didn´t work hard enough. It was scored 115-113, 115-114 and 114-114. McDonnel retained the WBA title as he was cut in an accidental headclash and the fight had to be stopped and declared a No Contest. 39-38 and 39-37 for Eubank and 39-37 Bechelaghem. fight off as Wassing got injured and had to pull out. A big martial arts event that included 19 fights. WBC and WBO middleweight titles. WBFed Int´l 140 lb title. End of the line for Harroche Horta, who is no middleweight. Floored twice in the fourth and again in the 8th before it was stopped. IBO I/C title at stake in his battle between journeymen de luxe. WBFed female superbantam title, 96-95, 96-94 and 96-94. 39-37 and 40-37 for Tsurov and 39-37 Bocharov. 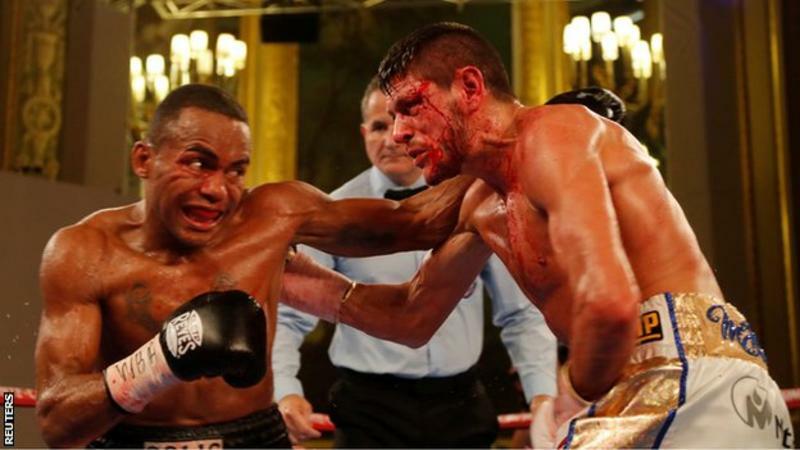 Rodriguez retained the Spanish superbantam title, scored 94-92, 95-92 and 94-93. Rodriguez was down in the fourth and fifth and had a point deducted in the ninth. Castro was hurt to the body and went down in the eighth.